I’m a really visually oriented person. I need to see something right in front of my face to be able to envision it in my life. Like outfits! Pinterest for me is IT for outfit inspiration (despite how they redesigned it to only show what they think I want to see. No bueno, Pinterest!) I save outfits I want to try out and tweak for my own life on my phone all the time. It helps me keep things fresh and fun. I was looking through my blog pins on Pinterest last week and noticed I had pinned a TON of Fall looks, both past and present, that I thought would be fun in one place. So voila! 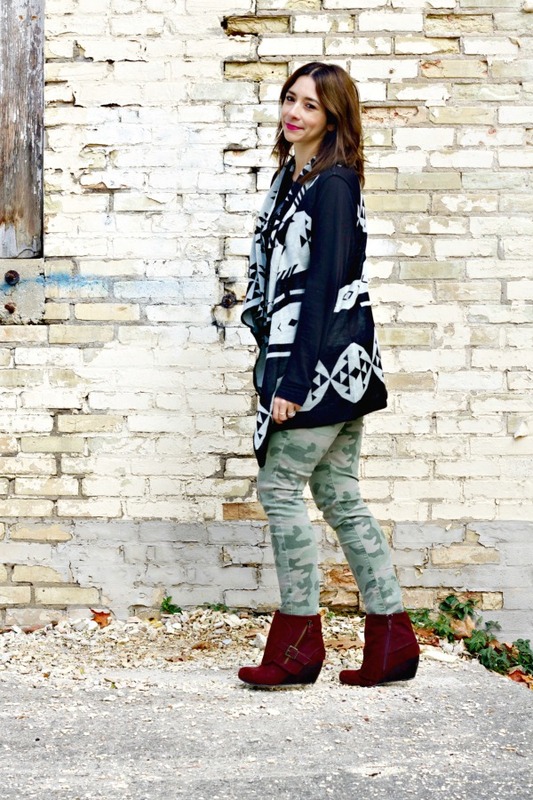 14 Fall outfits for you to try, right now! 1) Chambray on chambray: This is one of the easiest looks to try. I like adding a fun statement necklace to jazz it up, as well a colorful hat to make it pop a bit more. For me, half tucking the top in (just jam your fist into the front part of your pants between the two belt loops!) is key, as is wearing slimmer fit jeans in a contrasting denim color. Similar top, pants, boots and bag. 2) A fun printed top, cuffed skinnies, and a burgundy cross body bag: You’ll start to see that I tend to take one thing (cuffed, dark denim skinny jeans), and create outfits from that. I love any type of neutral, tan boot as well. My fringe ones and Sam Edelman Petty boots are my current faves. Add in a colorful cross body bag (Target has great ones! ), and a fun printed top (Old Navy, I’m looking at you! ), and you are SET. Exact blanket scarf, tunic top, jeans and boots. 3) Blanket scarf, tunic top, tassel boots: My original post on this was about how I can’t tie a blanket scarf to save my life, but tossing it over my shoulders as a cape of sorts works as well! I use it at home a lot, too, because I am always freezing and it helps me to NOT turn into a human Popsicle. 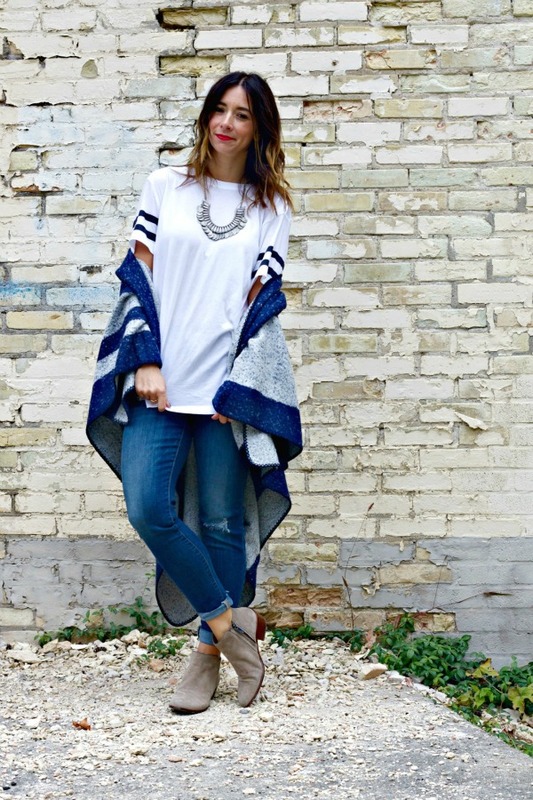 Similar sweater, scarf, wedges and jeans. 4) Cozy sweater, faux fur scarf, wedge peep toes: I love searching for the perfect, cozy yet slouchy sweater. While I don’t have this one above anymore, I have a similar one that I like to layer with my faux fur scarf for a little texture and interest. Also, these wedge boots are a go to for me. They have some coverage so I can wear them when it gets pretty chilly, yet the peep toe is cool and a bit edgy. Jacket, similar dress, and similar shoes. 5) Dress over jeans and a faux leather jacket: I find that so many dresses that are sold right now are just TOO SHORT, so I often just layer them over a pair of black skinny jeans. Throw on a faux leather jacket on top and you are good to go. 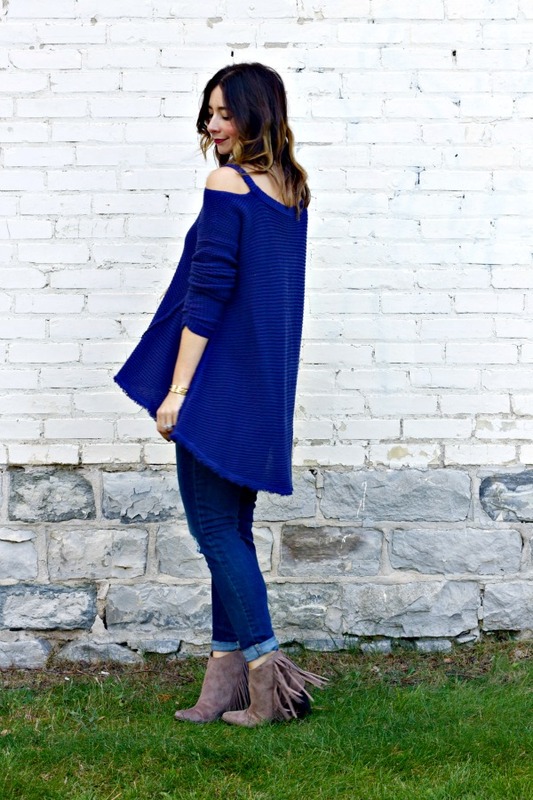 Cold shoulder sweater, jeans and boots. Cape, top, jeans and boots. 7) Cozy blanket type cape and a varsity tee: I love this cape TO DEATH. It is blanket soft and looks equally good dressed up a bit as it does thrown over a sweatshirt, jeans, and Hunter boots. Dress (on sale! ), similar sweater, and fringe boots. 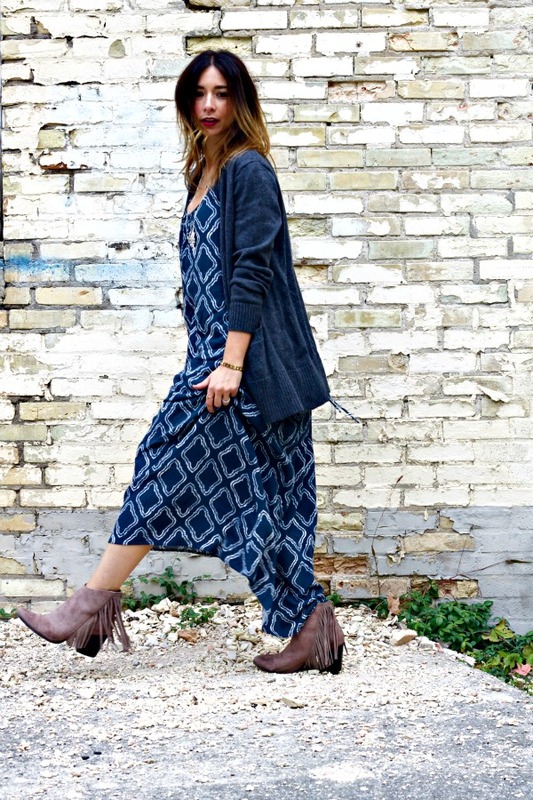 9) Summer weight dress and a chunky cardigan: Something I really love to do is take a dress that I normally would have to out away come Fall, and adding in a sweater and boots to extend the wear of it. Similar jacket, pants, boots and exact bag and tee. 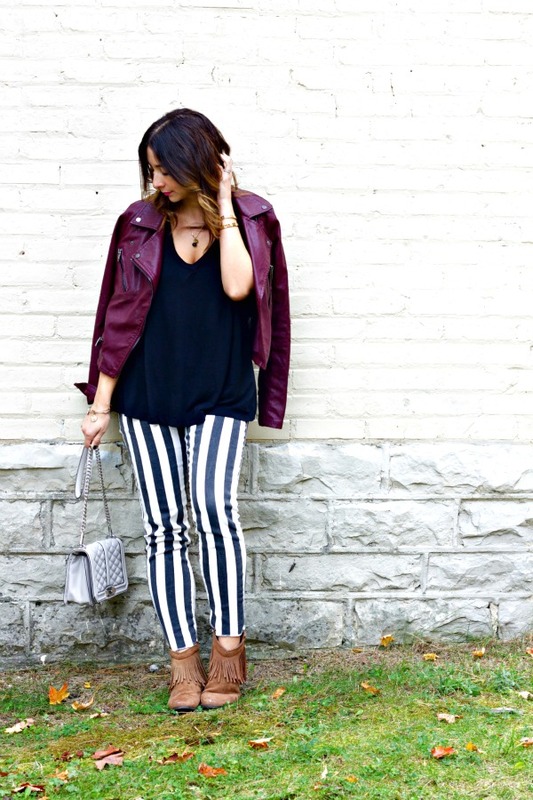 10) Burgundy faux leather jacket, striped pants, and a simple tee: Okay, I realize striped pants aren’t for everyone, but they really are so fun to wear! They become the focal point of an outfit, so pairing it with a simple tee and boots is the easiest thing ever. Similar plaid top; similar vest, faux leather leggings and studded heels. 11) Plaid, faux leather pants, and a faux fur vest: I really, really love my faux leather pants. They make every single outfit better, in my opinion! One of my favorite looks is to layer my fur vest over a longer top and pants, it just looks fun and gives a cool, layered look. Sweater (on sale! ), hat and similar boots. 12) Jean shorts over tights and a cozy, oversized sweater: Wearing tights and shorts in the Fall is something I love to do! It is slightly unexpected and always makes me feel a little cooler than I actually am. 13) A fun pattern mix: I LOVE mixing patterns. More often that not I have about 2-4 different patterns going on in one look. Black and white patterns always work together, as does leopard with anything, and stripes, too! Similar sweater, jeans and boots.